Runnels’ text teaches the readers of The Red Man and Helper about the culture of the Sanpoil tribe. 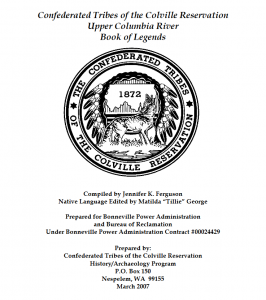 The introduction to The Confederated Tribes of the Colville Reservation Upper Columbia River Book of Legends states that the the legends are “spiritual and religious beliefs that connect [the tribes] with the land” (Confederated Tribes 5). In his text, Runnels shows the reader some of the spiritual and religious beliefs of the Sanpoil tribe, such as the existence of the “Great Spirit.” Through this, the reader learns that despite being converted to Roman Catholicism, they still believe in their own deity instead of the one suggested in the Catholic belief. However, through doing so, Runnels shows that his tribe’s religious beliefs are similar to many other religions, as he shows that they believe they are being protected and cared for by a higher power. Furthermore, the belief in the “Great Spirit” also demonstrates the belief that the tribe were once seen as animals, and through creation of the sun, became superior beings. These two elements of the legend show some of the culture of the tribe. Through his work, Runnels’ creates an anthology that reflects the spiritual and religious beliefs of the tribe, which justifies the text’s inclusion in the anthology. As touched upon in the Cultural and Historical Context, Runnels’ story has many similarities to elements of other Sanpoil legends. Many of these elements represent themes in the Sanpoil tradition, such as the stealing of fire, overcoming “difficult struggles”, and difficult weather conditions. Due to the inclusion of these thematic similarities, Runnels’ text becomes somewhat of an anthology of Sanpoil legends. Due to the Sanpoil belief that their legends are more than myths (Confederated Tribes 5), Runnels’ text effectively summarizes important themes in Sanpoil religion, showing its immense cultural value. This also supports Runnels’ work as a tribal educator, as highlighting key themes of Sanpoil legends would help readers better understand the Sanpoil culture. One could argue that the inclusion of the elements of social evolution suggests that Runnels was an assimilator, rather than a tribal educator, but this is not the case. According to the story, “overcoming the forces which had caused the fire to be extinguished” would prove their superiority, which is ultimately accomplished in the end. Thus, it can be assumed that after this story takes place, the tribe considered themselves to be more “socially evolved” than animals. This creates an interesting resonance with the Carlisle Indian School, as one of Henry Pratt’s goals was to make the “savages” more “civilized.” However, based upon Runnels’ conduct records, we see that he was always a student of good conduct, which suggests that he was actually quite “civilized” to begin with. Furthermore, there is little evidence that suggests that this resonance is a fact, as there are few primary sources that show any sort of struggle in Runnels’ life. Thus, it can be assumed that Runnels’ is only a tribal educator, and nothing more. The cultural elements provide interesting looks into some religious and spiritual beliefs of the tribe. From these elements, it can be assumed that Runnels attempted to educate people who read The Red Man and Helper, about the beliefs and views of his tribe. From his records, we can conclude that he would later move back to Keller, Washington, a town that is incredibly on the Colville reservation. It can be assumed that this was to keep him close to family, and would allow him to fully embrace his Sanpoil heritage. From his text, we can assume that Runnels’ was attempting to teach readers of The Red Man and Helper of Sanpoil culture, which he succeeds in doing, making the text worthy of our anthology. 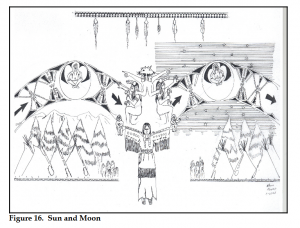 This entry was posted in Louis Runnels, Tribal Educators and tagged Colville Reservation, Cultural Values, Educator, Fire, Religious, Sanpoil, social evolution, Spiritual, Sun, The Great Spirit. Bookmark the permalink.